Enumeratio Lichenum Iconibus et Descriptionibus illustrata. La Corsa delle Slitte in Vicenza nel Carnovale MDCCLXXXIV. Philosophische Versuche über die magnetische Materie, und deren Wirkung in Eisen und Magnet. Aus dem Lateinischen übersetzt und mit Anmerkungen und Zusätzen des Verfassers vermehrt von C. G. Eschenbach. Jean-Jacques A Mr. S. [Servan] sur des réflexions contre ses derniers ecrits. Lettre pseudonyme. [Von Claire-Marie Mazarelli, Marquise de la Vieuville de Saint-Chamond]. A Voyage to the Pacific Ocean; Undertaken by Command of His Majesty, for Making Discoveries in the Northern Hemisphere: Performed Under the Direction of Captains Cook, Clerke, and Gore, in the Years 1776, 1777, 1778, 1779, and 1780. London: Printed for John Stockdale. 1784. First Edition. Hardcover. First octavo edition. In four volumes. xii, [v]-viii, 370pp; xii, 359pp; xii, 400pp; xii, 310pp + index. Contemporary tree calf professionally rebacked, with red and green morocco labels lettered in gold on the spines. Portrait frontispiece, map, and forty-nine engraved plates. Published in the same year as the first official account. With the bookplate of T. W. Dison on the front pastedown of volume III. Dealer's annotations in pencil on the rear pastedown of volume I, corner tear to front free endpaper of volume II, light wear to extremities. An appealing set. ; Octavo . Dublin: Printed by Joseph Hill, at the College Printing-House. VG : in very good condition. Rebacked with later calf/gilt spine. Author's inscription on fep. 1784. First Edition. Mottled calf gilt. 210mm x 130mm (8" x 5"). 203pp. 2 plates, one folding. Inscription reads: 'For the Right Honourable Lord Viscount Castlereagh from his most obliged and sincere servt'. .
Geschichte des Fortgangs und Untergangs der Römischen Republik. Aus dem Englischen frey übersetzt und mit Anmerkungen und Zusätzen begleitet von C. D. B. 3 Bände (in 4= komplett). Charleston: John Miller, 1784. 102,pp. Antique-style half calf and marbled boards, leather label. Light dampstaining in margins. Very good. A collection of the laws passed by the South Carolina assembly in the spring of 1784. 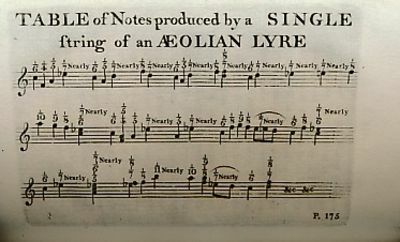 One of an edition of 300, with two separately printed leaves bound after pages 78 and 92, as called for by Gould & Morgan, who note seven copies of each imprint. The added leaves add legislation omitted from the original printing. Legislation was passed requiring slaveowners to report all slaves held, for regulating trade with the British, to compensate soldiers for losses in the Revolution and for confiscating Tory estates, and for various civic improvements. A significant group of imprints issued immediately after the end of the Revolution. GOULD & MORGAN 714, 715, 716. EVANS 18789. ESTC W30619. OCLC 19940208. Gesamtansicht über die Wied mit Schloßruine Altwied ('Das Schloss Altwied'). Nya handels-bibliotheket [The new library of commerce]. Första delen. Histoire des progrès et de la chûte de la République Romaine. (Ouvrage orné de Cartes & traduit de l\'Anglois. THEORIE DU MONDE ET DES ETRES ORGANISES, SUIVANT LES PRINCIPES DE M*** Grav&eacute;e par D&#146;A:-Ol. The Witâ€™s Magazine; or Library of Momus. Being a Compleat Repository of Mirth, Humour, and Entertainment. Philadelphia: Hall and Sellers, 1784. 237pp. Later half calf and patterned boards. Titlepage tanned, with several contemporary ownership inscriptions and notations. Some light tanning, but overall internally clean. Last six pages bound in upside down and backwards. Contemporary ownership inscriptions on verso of p.237. A good copy. 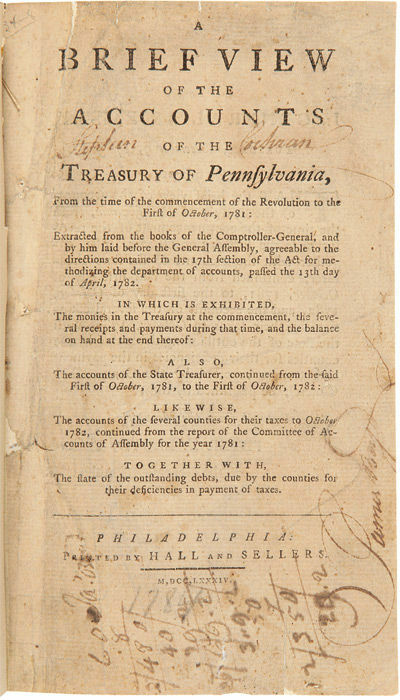 A printed account of the Pennsylvania Treasury during the Revolutionary period. The text is printed in chart form throughout, with a tally of expenses at the bottom of each page. A fascinating document. The first treasurer of the State was Michael Hillegas, who was in the role in the provincial government but who turned over the job to the polymath David Rittenhouse by August 1776. 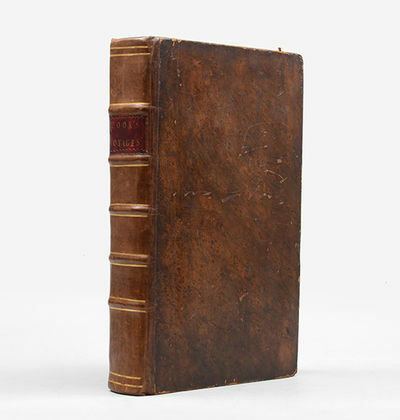 Most of the text covers in detail Rittenhouse's tenure, until the spring of 1782, mostly concerned with expenditures relating to the war effort. During this time he also personally supervised the production of war material such as the casting of cannon. NAIP locates eleven copies. A key work for the finances of the Revolution. EVANS 18679. HILDEBURN 4438. SABIN 59927. NAIP w021209. ANB 18, pp.553-55. London: for W. Strahan; and T. Cadell,, 1784. The third edition, with additions, in three volumes. 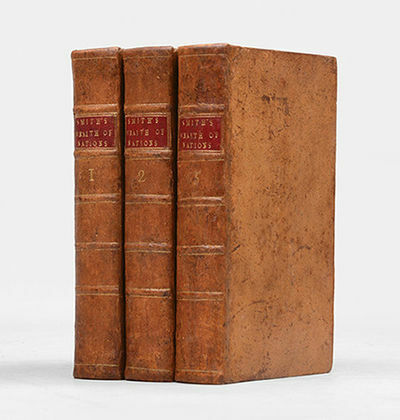 3 volumes, octavo (209 Ã— 125 mm). 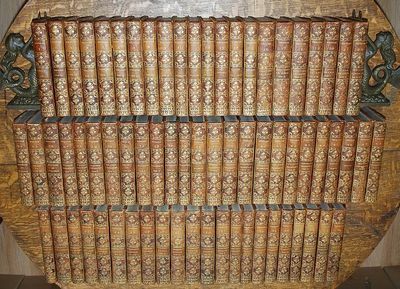 Contemporary speckled sheep, gilt ruled and numbered spines, red morocco labels. 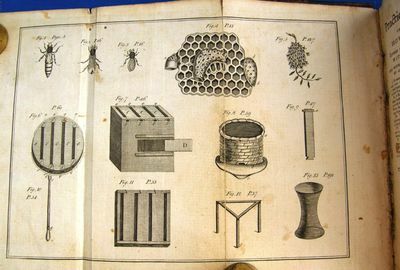 Joints, extremities of spines and corners professionally refurbished, small area of worming to title and first leaf of Contents in volume II, general foxing. 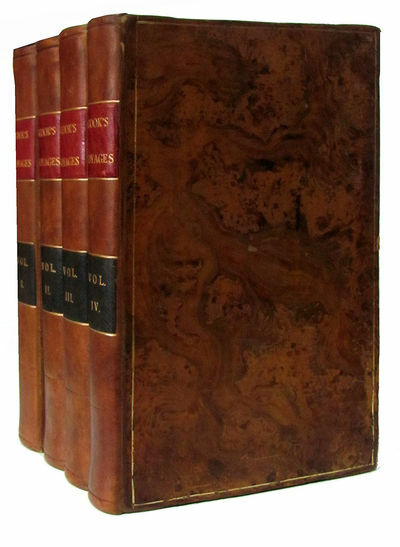 An attractive set in a contemporary binding. First octavo edition, third overall, of the "first and greatest classic of modern economic thought" (PMM). This uncommon edition contains several additions including a new chapter titled "The Conclusion of the Mercantile System". Adam Smith's masterpiece, first published in 1776, is the foundation of modern economic thought and remains the single most important account of the rise of, and the principles behind, modern capitalism. "The Wealth of Nations had no rival in scope or depth when published and is still one of the few works in its field to have achieved classic status, meaning simply that it has sustained yet survived repeated reading, critical and adulatory, long after the circumstances which prompted it have become the object of historical enquiry" (ODNB). This copy has an appealing Philadelphia provenance: each volume carries the engraved armorial bookplate of Charles Chauncey, ownership inscriptions on each title page: "From Charles Chauncey to Elihu Chauncey" (dated 1811) and "Charles Chauncey Savage 1877". Charles and Elihu would appear to be popular names in the Chauncey family but this pair are the brothers of Nathaniel Chauncey (1789-1865) who briefly practised law in Philadelphia. Elihu (d. 1843) is best remembered for being the first President of the Philadelphia and Reading Railroad, one of the first railroads constructed in the United States. He has been described as "a man of national importance. He became a complete master of political economy, and was, in that science, one of the most accomplished men the country produced. He was active in public affairs, especially in the financial policy of the Government, and by reason of his rare ability, his opinions were sought whenever loans were to be floated by municipal, state or federal authorities" (John Frederick Lewis, The History of an Old Philadelphia Land Title, Philadelphia, 1934). Rapport des commissaires chargés par le Roi, de l'examen du magnétisme animal. per onorare la memoria di LIVIA DORIA CARAFFA Principessa del S.R. Imp. e della Rocella, di alcuni rinomati Autori. Paesti, quod Posidoniam etiam dixere, rudera. Rovine della città di Pesto, detta ancora Posidonia. ONT>, 1784 Book. Very Good. Hardcover. 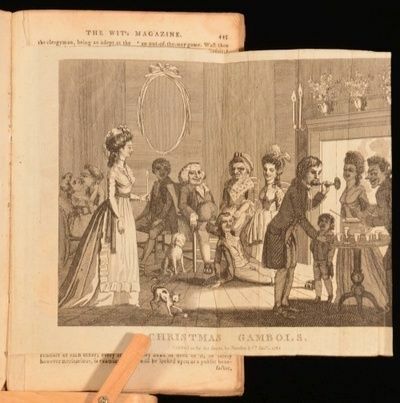 A volume of six issues of The Wit's Magazine dating from July to December 1784. 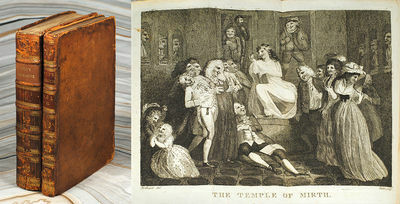 With four sought after fold-out engravings, some of them by the painter and engraver Samuel Collings. Including amusing articles, letters, poems and enigmas. Previous owner's ink inscriptions to front and rear pastedowns of William Margetts of Deddington in Oxfordshire. 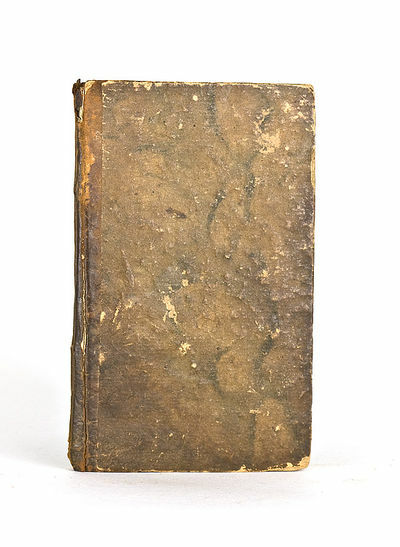 Condition: In a quarter calf binding with marbled paper-covered boards. Externally, rather worn and rubbed with slight loss to paper at extremities and to leather at head and tail of spine. Joints starting. 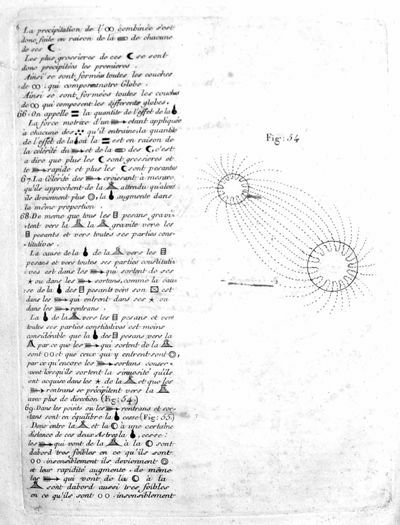 Internally, two fold-out plates are missing, as well as a total of eight pages of text. Otherwise, generally firmly bound, bright with occasional spots and marks and curling to plates. Overall: GOOD ONLY. RUIZ DE LUZURIAGA, Ignacio María. Mémoire sur la décomposition de l&#146;air atmosphérique par le plomb. Das Kostum der meisten Völker des Alterthums, durch Kunstwerke dargestellt und erwiesen. Aus dem Französischen übersezt, berichtiget, mit Zusätzen und einer Vorrede begleitet von Georg Heinrich Martini. Nya handels-bibliotheket. Första delen [The new library of trade. Part one]. [Hartford, Connecticut], July 13, 1784. 8" x 4.25". "Autograph Document Signed ""Saml Huntington Lieutt Governor,"" 1 page, 8"" x 4.25"". [Hartford], July 1784. On laid paper. Fine condition.In full, ""These may certify That at a City meeting of the City of Norwich on the Second Tuesday of July 1784 the oath provided by Law to be taken by the Mayor of said City was duly Administered to the Hon Benjamin Huntington Esq Elected Mayor of said City; By me Saml Huntington Lieutt Governor""Benjamin Huntington (1736-1800) represented Connecticut in the Continental Congress (1780, 1782, 1783, 1788) and in the 1st U.S. Congress (1789-1791). He served as Mayor of Norwich, Connecticut, from 1784 to 1796. Samuel Huntington, Lieutenant Governor of Connecticut from 1784-1786, was Governor from 1786-1796. Samuel ostensibly began his political career in 1764 when Norwich sent him as one of their representatives to the lower house of the Connecticut Assembly." (COOK, James.) ANDERSON, George William. Storia romana. Dalla fondazione di Roma persino alla Traslazione dell'Imperio sotto Costantino: Scritta nell'idioma francese dall'Abate Delle Fontane sopra l'originale inglese . e trasportata nell'italiano. Storia de&#146; viaggi intrapresi per ordine di S.M. Britannica dal Capitano Giacomo Cook (13 Bände). Neapel, La Nuova Societa` Letteraria e Tipografica, 1784/85. - Mit gestochener Titelvignette, 1 gefalteten Tabelle, Halbpergamentbände der Zeit, 20 x 12,5 cm, Einbände angestaubt, berieben und bestossen, innen teils stockfleckig. Seltene italienische Gesamtausgabe der Reisen James Cooks. WINTER IN ROTTERDAM"De Rivier de Maze Voor de Stadt Rotterdam in het begin van het Jaar 1784'Gravure "geteekend en in "t kooper gebragt door A. v.d. Haar en J. v.d. Spruit', later met de hand gekleurd. Afm. 30,5 x 51 cm.Levendig gezicht, arm en rijk op het ijs, koek en zopie, ijszeilers, sledes, paarden en wagens, stalletjes bieden hun waar aan.Oude Hoofd met Oude Hoofdpoort en achterzijde van de huizen aan het Haringvliet; aan het einde daarvan zijn de Admiraliteitswerf aan het Boerengat en de molens op het Bosland en langs de Oostzeedijk zichtbaar.Prijs: â‚¬ 2.150,- (incl. lijst). Isle de France: Imprimerie Royale, 1784. Quarto. Moderately worn with loss at foredge and gutter margins, not affecting text. Lightly soiled and dampstained. Good. An early and unrecorded imprint from the colonial press at the French colony of Mauritius, also known as the Ile de France. 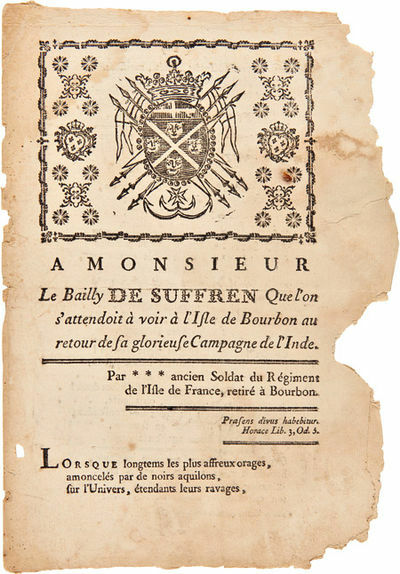 The text comprises a poem in eleven stanzas by an anonymous soldier from the Regiment of the Isle de France who retired to the island of Bourbon. As most early imprints from Mauritius are official documents, this piece, a work of local literature, is particularly interesting and desirable. The Dutch were the first Europeans to become interested in the island, taking possession in 1598. After exploiting the island's dense forests for a century and introducing the cultivation of sugar cane and cotton, in 1710 the Dutch abandoned the colony. The French soon claimed it as "Ile de France," and the island remained under the control of the French East India Company until 1767. During the long war between France and England at the beginning of the 19th century, Mauritius proved to be an important strategic naval base; as a result the British took charge of the island in 1810, and the Treaty of Paris confirmed official British possession in 1814. It remained an important sugar producing colony, and in the 20th century agricultural production was expanded to include tea, rice, and other produce. Printing began on Mauritius in 1768. During the French period, until 1810, only about 400 imprints were produced, mostly in the form of official documents and newspapers, though there are also almanacs and a few other items. All are quite rare. No copies located in OCLC, and not recorded by Toussaint in his bibliography of Mauritius imprints. [Hartford, Connecticut], September 13, 1784. 8.25" x 6.25". "Autograph Endorsement Signed, ""Received the Contents Saml Huntington,"" as Chief Justice of the Connecticut Supreme Court, on the verso of an Autograph Document Signed, ""Oliv. Wolcott, Jr.,"" 1 page, 8.25"" x 6.25"", ""Pay Table Office,"" [Hartford], September 13, 1784. Light dampstains, some minor marginal tears, expected folds, else fine.Wolcott, Jr., together with Elezer Wales, members of the Pay Table Committee for the State of Connecticut order a payment to ""the Honorable Samuel Huntington, Esq. 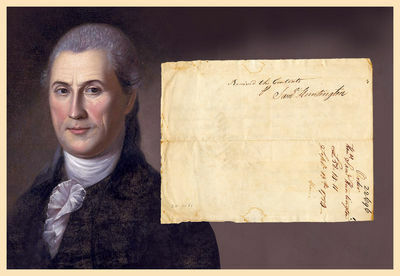 Fifty eight pounds fourteen Shillings and eleven pence Lawful Money --- and charge the State..."" Huntington would continue in his role as Chief Justice of the Connecticut Supreme Court through 1785. In 1786, he became the Governor of Connecticut, an office he would retain until his death in 1796. Provenance: Charles E. Sigety. " Grenada: Printed by John Spahn, 1784. Splitting along most of the fold, but the two leaves not detached. Stained along upper edge, lightly tanned. Good. In a half morocco box. A very rare Grenada imprint, printing extracts from the treaties which concluded the French and Indian War and the American Revolution, especially those portions pertaining to Grenada, and to Britain's guarantee of freedom of religion in her colonies. 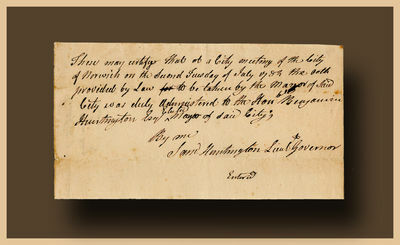 This proclamation was printed in Grenada by John Spahn, and although undated was likely produced in 1784, following the news of Britain's re-acquisition of Grenada after the Treaty of Paris concluding the American Revolution. Four articles are reprinted from the Treaty of 1763 ending the French and Indian War: Article 4, passing all of Canada over to the British, and ensuring freedom of religion to the former French subjects; Article 9, ceding Grenada, the Grenadines, St. Vincent, Dominica, and Tobago to the British and ensuring the same religious freedoms as those guaranteed to the former French subjects in Canada; and two articles pertaining to administrative matters. Four articles are also reprinted from the 1783 Treaty of Paris which ended the American Revolution: Article VII through which Britain ceded St. Lucia and Tobago to the French, and in which the French guaranteed religious freedom to the Protestant inhabitants of the islands; Article VIII, which gave Grenada, the Grenadines, St. Vincent's, Dominica, St. Christopher's, Nevis, and Montserrat, and under which the British guaranteed religious freedom; and two other articles addressing legal and administrative questions. 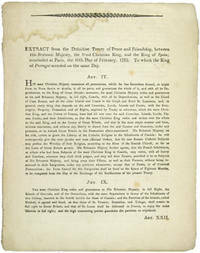 The third item reprinted is a proclamation by George III, "given at Our Town of Fort Royal," in 1764 proclaims the sovereignty of British law on Grenada and the other recently acquired islands: "the laws of Great Britain are in force in this Island, as far as the Nature and Circumstances of the Colony will permit; and that all other Jurisdictions, Offices, Commissions and Proceedings for the future, not founded on those Our Laws of England, are hereby declared to be absolutely determined, utterly void, and totally abolished." The Proclamation authorizes the calling of a General Assembly for the islands, and gives the Governor General the power to institute laws and courts on the island until the legislature convenes. Printing on Grenada began as early as 1765 and continued through the French occupation of 1779-83. OCLC carries only one listing for John Spahn as a printer on Grenada - as publisher of the ST. GEORGE'S CHRONICLE AND GRENADA GAZETTE in 1800. Although the present extracts are undated, it is most likely that they were printed shortly after the British regained control of Grenada in 1784. This document is not listed on OCLC, nor are any Grenada imprints from the 1780s. A rare collection of treaty extracts carrying important information about the political and religious state of affairs in Grenada and the West Indies. Due to the humid climate in the area, 18th-century imprints from the West Indies are virtually unobtainable. Onomatologia curiosa artificiosa et magica. Oder natürliches Zauber-Lexicon [Zauberlexicon; Zauberlexikon] in welchem vieles Nützliche und Angenehme aus der Naturgeschichte, Naturlehre und natürlichen Magie nach alphabetischer Ordnung vorgetragen worden.